Congenital Hypothyroidism is an important clinical problem. In this article, we present a clinical update, mainly intended for the primary care practitioner. Primary hypothyroidism is an extremely common disorder encountered in every endocrine clinic. We found that patients who have been on treatment and follow up elsewhere for many years lacked a basic understanding of their disorder and held wrong beliefs regarding the same. We felt a study on the knowledge, awareness and practices of patients with hypothyroidism would help the physician to focus on specific issues during patient education, clarify commonly held mis-beliefs during their consultation and thus enhance patient compliance and follow up. So we decided to do a KAP (Knowledge, Awareness and Practices) study on patients with primary hypothyroidism. A search carried out on Pubmed andMedscape did not reveal previous similar studies in medical literature. The IMPERIAL (Indian Medical Practitioners Expressions Regarding Drug Intervention In All Aspects of MetaboLic Syndrome) study, which assessed Indian physicians' prescribing habits related to metabolic syndrome, also assessed their preferred management strategies in hypertension associated with thyroid dysfunction. 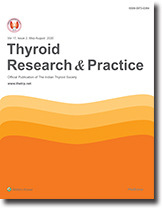 This paper reviews the results related to thyroid disease, obtained from the IMPERIAL study. There is a clear consensus for the use of beta-blockers as first line antihypertensive therapy in patients with hypothyroidism. For hypothyroid patients with hypertension, ACEI, ARB and diuretics are recommended as first - line therapy by one third of the physicians each. It is hoped that these results forms the basis for a debate, and final consensus, on the management of hypertension in thyroid disorders. Objective: To report a patient with Graves' disease who developed hypoglycemia due to Carbimazole. Methods: The clinical history, physical findings and laboratory data of the patient were recorded. The mechanism of insulin antibody mediated hypoglycemia in this case is discussed. Results: A 28-year-old woman with Graves's disease developed fasting hypoglycemia on treatment with Carbimazole. She had high insulin and Cpeptide levels along with anti-insulin antibodies. Carbimazole was stopped and Graves ' disease was treated with radioactive iodine. She had no further episodes of hypoglycemia after discontinuing the drug. Conclusions: Though IAS is very rare, it should be considered in the differential diagnosis of patients with hyperinsulinemic hypoglycemia, especially in those receiving anti-thyroid drugs for Graves 'disease.